An excellent IPS display that's a great choice for AMD/FreeSync users. Fast; customizable; solid build quality. Not exactly cheap; FreeSync doesn’t play nicely with overdrive; not as spectacular as a super-side of 4K screen. Consider the key metric s. We’re talking 27-inch, 2,560 by 1,440 pixels, 144Hz, and adaptive syncing. Oh, and here’s the real kicker. We’re also talking IPS. Cue much rejoicing. The new Asus MG279Q ticks an awful lot of boxes. It’s not a super-wide panel with 3,000-plus horizontal pixels. Nor is it a 4K box. But 2,560 by 1,440 pixels is arguably where the sweet spot is right now in terms of matching pixel grids with GPU power—4K panels are marginal for smooth rendering on a single GPU. Intriguingly, you get all this for less money than Asus’s familiar ROG Swift monitor. That panel is very similar in many regards. It’s 27 inches, has 2560x1440 pixels cranked out at 144Hz, and also sports adaptive sync. But it also differs in two critical regards. The ROG Swift’s adapative sync is the Nvidia-flavored G-Sync technology and its LCD is a TN item. This screen, meanwhile, sports AMD’s competing FreeSync tech and packs an IPS panel. Game on for fratricidal fun? Yes and no. For starters, it’s absolutely no contest when it comes to image quality. This new IPS model whips the Swift raw with the spiky end of a DVI cable. It’s an absolutely gorgeous screen. The colors are as good as we’ve seen pretty much anywhere on any screen. It’s just the most glorious combination of accuracy and saturation, at the same time as seeming perfectly natural and not remotely forced, the latter being a routine issue with VA panels, which often look punchy but thoroughly OTT. 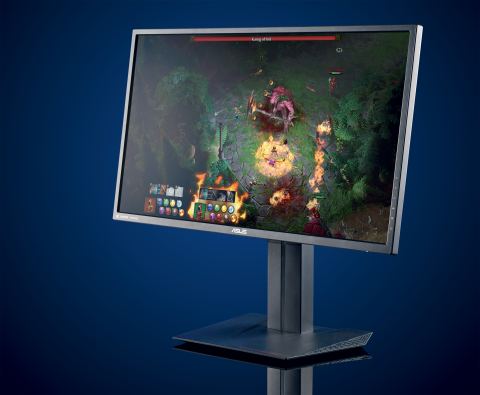 All this gives it a spot in our best gaming monitors roundup. Where things get complicated, both in terms of the comparison with the Swift and in terms of actual technical implementation, is when it comes to adaptive sync tech. Adaptive sync means aligning the refresh rate with the output of your graphics card for improved smoothness and an end to screen tearing. We’ve known for a while that AMD’s FreeSync technology is a little rough around the edges, and unfortunately, that remains the case here. For starters, FreeSync doesn’t currently play nicely with response-enhancing overdrive tech. Long story short, you get some nasty inverse ghosting with FreeSync enabled. The MG279Q actually does a good job of getting to grips with the problem, thanks to a wide choice of adjustments for the overdrive setting, which is accessed via Asus’s excellent OSD. Set it to minimum and there’s little-to-no ghosting, but a fair bit of blur. Crank it up to max and the ghosting is utterly grim. At around 40 percent the blurring is fine and it doesn’t add any noticeable ghosting either. Next up, the FreeSync in this implementation is also limited to a maximum refresh rate of 90Hz. That’s enough to get much of the smoothness benefit of high refresh rates, but not all of it. Of course, you could argue that once you’re up over 100Hz, the benefits of adaptive sync are marginal. So, if your graphics card is up to it, running with FreeSync disabled and the panel set to full 144Hz reheat could be the answer. Casting a shadow over all of this is the fact that you’ll need an AMD GPU to run FreeSync, while G-Sync screens like the Swift need Nvidia graphics. Given that monitors are generally pretty long-term purchases, that makes for a potential GPU vendor lock-in that leaves us a little uncomfortable. Not that this is Asus’s fault. But it’s certainly worth bearing in mind. That said, you’re not really paying extra for the FreeSync capability. So view the Asus MG279Q as mainly a 144Hz IPS panel and it’s still a very appealing proposition. Is it the best gaming monitor yet? Very possibly.